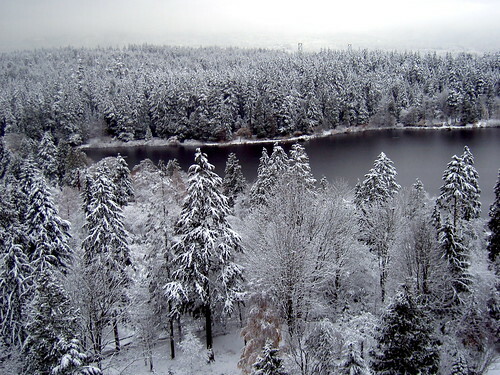 Vancouver is snowed big time even it’s November. It’s cold! We had friends over from England on the last Friday and we held a welcome party for them. I had an order from Mrs. K to put this sushi photo on my blog, so I will. I borrowed a mold for pressed sushi from my mum and I made this smoked salmon sushi. I put avocado in the middle. When I served this on a table everybody thought it was a sweet cake:) The good dish in other things I made was Tofu nuggets. 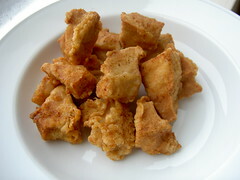 A frozen and dried tofu called Koya Dofu is used for this recipe. I thought it would be fun to cook it for a vegetarian friend. Everybody was surprised to know it was Tofu because it really tasted like chicken. I think kids would love this food. I translate the recipe from this site. *Dashi no moto is a fish stock used for various Japanese cuisine. You can normally buy it in a Japanese or Chinese grocery store. 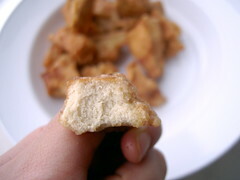 Koya Dofu looks like this. Soak the Koya dofu in water. After 10 minutes, squeeze water out of the Koya Dofu. Mix water, Dashi no moto, Soy Sauce, Sugar in a frying pan (tefron is good), and place Koya Dofu on the pan. Boil with medium low heat for 40 minutes until the water is gone from the Koya Dofu (but doesn’t need to be completely gone. Please don’t burn the Koya Dofu.) Tear the Koya Dofu into 6 pieces with your hands. Mix the butter and dip the Koya Dofu and deep fry. When the clour becomes nice golden brown, it’s ready to eat. This entry was posted in Food at home, Vancouver. Bookmark the permalink. 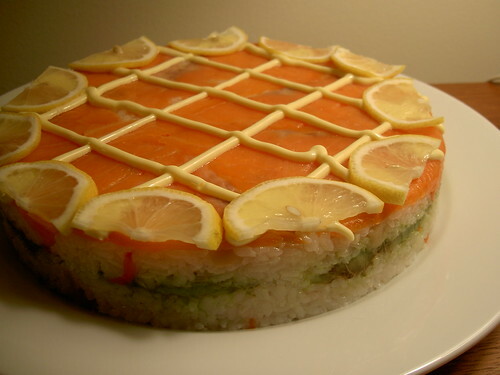 I can’t say enough about that sushi-cake. Thank you again for making it for us. I showed a few people at work and they were impressed. I’m going to have sushi for lunch today. ☆Mrs. K, I think sushi cakes are easier to make than sushi rolls. You are deceived!!! Hee hee hee. I cannot believe how common it is to have sushi as a meal or a snack in Vancouver. It’s great! Otherwise my meal is not appreciated.